This horse trial was the culmination of the 2008 competition year for C Square Farm. Courtney rode her two 5-year-olds at the Training level, Who’s A Star (Tag), and Scout. 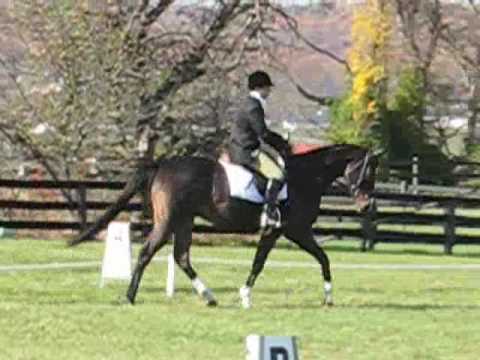 Both horses were very good in their dressage tests, and Scout even posted his best Training level test score to-date!. Next came Stadium jumping, and the course had several challenging questions for horse and rider. Tag showed impeccable form and posted a double-clean round. Scout also had a very good round, but had one unlucky rail. The cross-country course was also very demanding, but both Tag and Scout galloped around confidently and posted double-clears. The excellent jumping efforts of Courtney and the boys found Tag in 4th place of the Training Horse A division and Scout in 6th place of the Training Horse B division. It was a terrific end to the season!